It takes practice to get it right, the video below left, filmed in Thailand, is an excellent way to learn the technique. He's been doing it for years, watch his every step. In a bowl, combine water, egg, condensed milk, sugar, and salt. Mix well. Set aside. Sift the flour into a large bowl, and form a crater in the sifted flour. Pour the water/egg mixture into the flour, and mix well. Add melted butter. Knead this until the bowl is clean and you have a nice ball of dough. Lightly coat the dough ball with vegetable oil (we like canola oil). Let it sit for 30 minutes. Next, knead your dough a bit more, and form it into several balls (about double the size of a golf ball). Coat them with vegetable oil. Roll a ball of dough flat with a rolling pin, then cut from center out to edge. Roll it up as shown in pictures below. Push it in with your finger. Repeat this a few times. Now roll the dough ball into a very flat square sheet, coat it with a bit more oil, pick it up and place it on a hot (highest setting) pancake griddle that has melted margarine on it. You can use a skillet also, but we found that our electric pancake griddle works great. 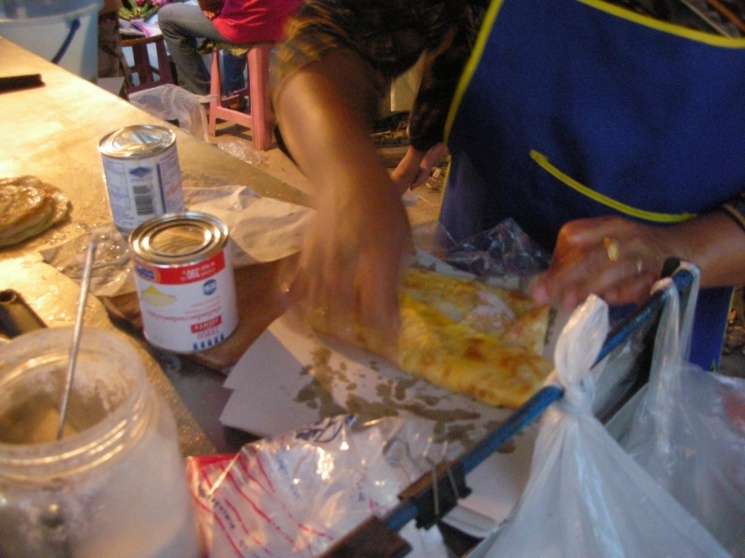 Add a bit more margarine and watch your roti become a delicious little masterpiece. It only takes a minute or two. Flip it over. Add fruit, egg, raisins, condensed milk, whatever. We really like to add condensed milk. Enjoy this recipe! It's a lot of fun, and very tasty. We've developed a good recipe here that works well. With some practice you can make it just like in Thailand. 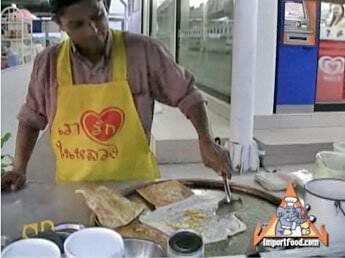 We were very happy that when our 11 year old son, who has spent many summers in Thailand, tried our roti for the first time and remarked "mmmm this tastes just like in Thailand!" 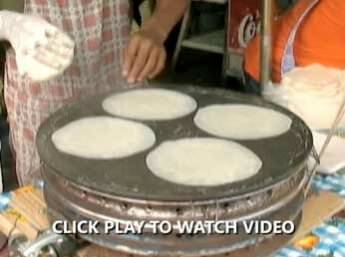 In February 2010 Jennifer Bain, Toronto Star's Food Editor, used our recipe and praised our Roti Street Vendor Video in a detailed story about roti "Rediscovering the banana pancake". NICE!!!!!! thats all i gotta say! 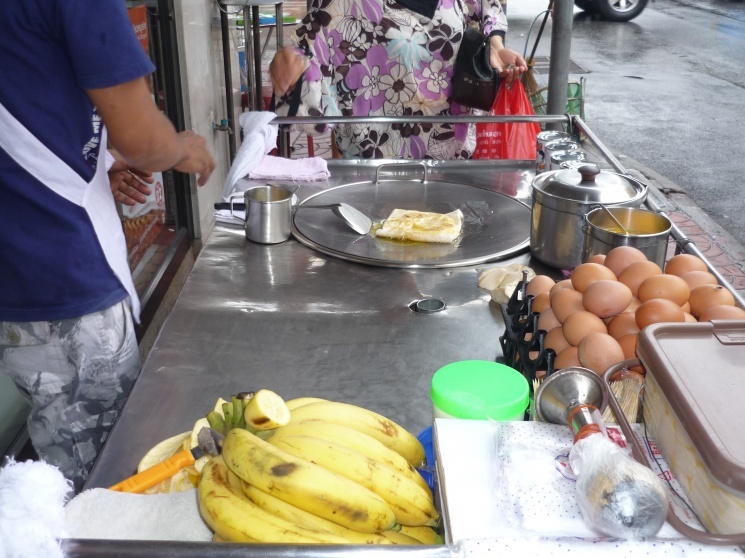 I just came back from holiday in Phuket at Kata Beach and ate these Banana "pancakes" every day as we luckily had a vendor next to our hotel. I tried several toppings like vanilla; peanut butter; honey or chocolate - and loved it all. They take a small ball of dough and press it flat and then rub cooking oil over it and "throw" the dough side ways until it has spread out into a paper thin - almost see through dough. then it goes onto a kind of a wok or hollow pan to cook. 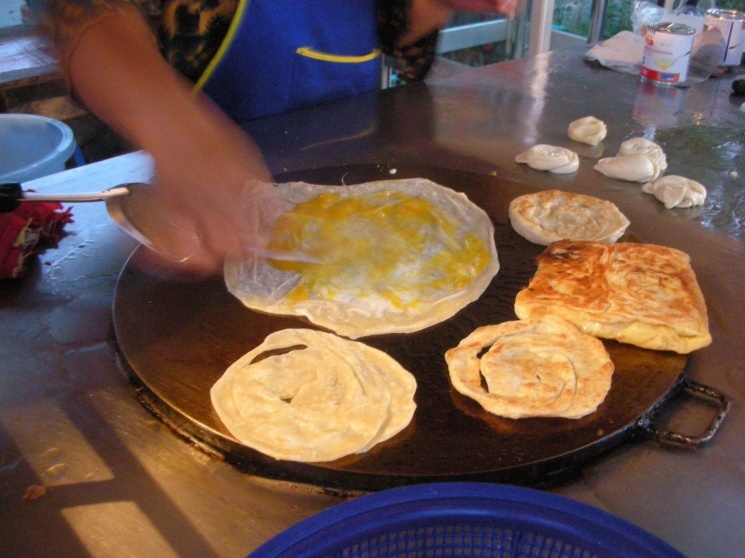 A banana is sliced onto the dough and then the dough is folded over the banana filling like a parcel. The parcel gets flipped over and fried on the other side. Then the pancake/parcel is cut in small bite size blocks. Thanks for that Heidi. The recipe, ingredients, background, links, videos and photos left me confused. Thanks for the recipe. Love it! 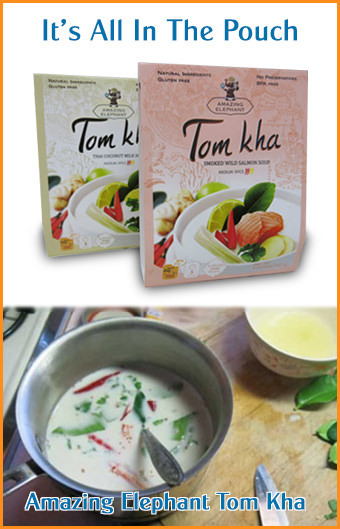 Just had this with condensed milk tonight. Loved it! 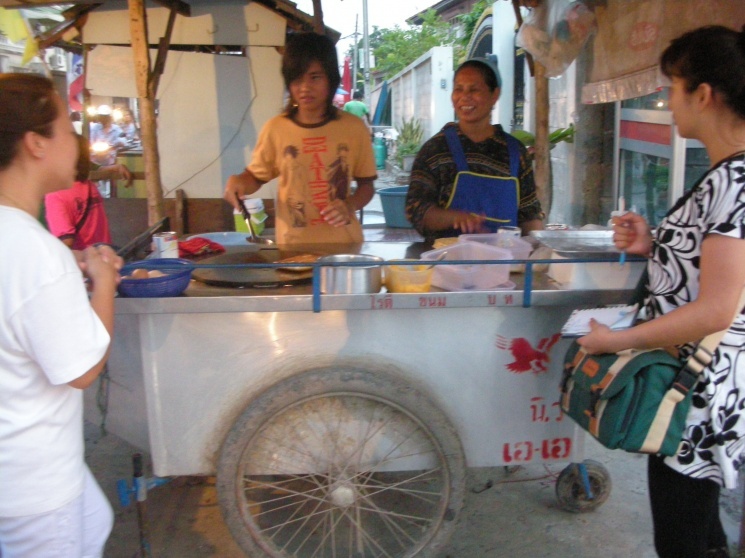 Another good roti is "Roti sai mai" from vendors in Ayuttaya. 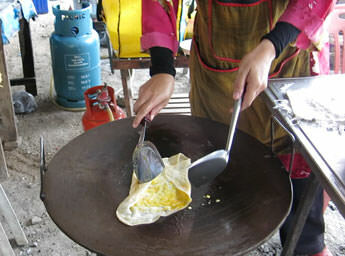 An almost paper-thin tortilla which you roll up with crystalized sugar cane (basically like cotton candy).